Each year, health care payers and providers in the United States spend about $496 billion on billing and insurance-related (BIR) costs, according to Center for American Progress estimates presented in this issue brief. As health care costs continue to rise, a logical starting point for potential savings is addressing waste. A 2010 report by the National Academy of Medicine (NAM) estimated that the United States spends about twice as much as necessary on BIR costs.2 That administrative excess currently amounts to $248 billion annually, according to CAP’s calculations. This issue brief provides an overview of administrative expenditures in the U.S. health care system. It first explains the components of administrative costs and then presents estimates of the administrative costs borne by payers and providers. Finally, the issue brief describes how the United States can lower administrative costs through comprehensive reforms and incremental changes to its health care system. Many of the universal health care plans being discussed to expand coverage and lower costs would lower administrative costs through rate regulation, global budgeting, or simplifying the number of payers.3 Each of these financing changes deserves consideration—even in the absence of major systemwide reform. The main components of administrative costs in the U.S. health care system include BIR costs and hospital or physician practice administration.4 The first category, BIR costs, is part of the administrative overhead that is baked into consumers’ insurance premiums and providers’ reimbursements. It includes the overhead costs for the health insurance industry and providers’ costs for claims submission, claims reconciliation, and payment processing. The health care system also requires administration beyond BIR activities, including medical record-keeping; hospital management; initiatives that monitor and improve care quality; and programs to combat fraud and abuse. Many studies of administrative costs limit their scope to BIR costs. The BIR component of administration is most relevant to systemwide reforms that seek to reduce the expenses related to claims processing, billing rates, or health insurance. The largest share of BIR costs is attributable to insurance companies’ profits and overhead and to providers8 where BIR costs include tasks such as record-keeping for claims submission and billing. Applying the NAM’s percentages of BIR costs to recent projections of national health expenditures from the Centers for Medicare and Medicaid Services (CMS), CAP estimates that BIR costs will amount to $496 billion for 2019.15 (see Table 1) According to CAP’s calculations, this includes $158 billion in overhead for private insurance; $56 billion for administration of public insurance programs; and $282 billion for the BIR costs of hospitals, physicians, and other care providers. CAP’s estimate does not include the administrative costs associated with retail sales of medical products, including prescription drugs and durable medical equipment. While U.S. administrative care spending is indisputably higher than that of other comparable countries, it’s unclear how much of the difference is excess and how much of that excess could be trimmed. The NAM report estimated that excess BIR costs amount to $190 billion—$245 billion in current dollars—or roughly half of total BIR expenditures in a year.20 The NAM report estimated that 66 percent of BIR costs for private insurers and 50 percent of BIR costs among providers are excess.21 Based on these percentages, $248 billion of the total $496 billion BIR costs in CAP’s updated estimate are excess administrative costs. Woolhandler and Himmelstein estimate that the United States currently spends $1.1 trillion on health care administration, and of that amount, $504 billion is excess.26 Woolhandler and Himmelstein rely on surveys of physicians’ time use and utilized physician income data to translate the share of time physicians spend on administrative tasks into monetary value; their estimate of excess costs is the difference between U.S. and Canadian administrative spending27 Woolhandler and Himmelstein’s original 2003 article estimated that Canada spent $307 per capita on health system administration, compared with $1,059 per capita in the United States. Assuming this difference is excess requires an assumption that a Canadian-style health care system would achieve an identical level of administrative costs in the United States. A separate criticism of the original 2003 Woolhandler and Himmelstein estimates, as articulated by Henry J. Aaron, an economist at the Brookings Institution, is that their methodology failed to account for differences in prices.28 Woolhandler and Himmelstein arrive at their national total administrative costs by tallying up costs in each country for items such as rent and salaries. As a consequence, the U.S.-Canada comparison captures not just the differences in the quantity of resources devoted to administration—such as physician time or office space—but also the differences in office rates, wages, and salaries. Taking Woolhandler and Himmelstein’s estimate of total administrative costs as a given and then making standard adjustments for price differences, Aaron argues that the two researchers exaggerated U.S. administrative spending in their 2003 report and that the true portion of excess would be about one-quarter less than what they estimated. Countries that have multipayer systems with stricter rate regulation also achieve much lower administrative costs than the United States. Administrative expenditures account for 4.8 percent of total health care expenditures in Germany, 3.9 percent in the Netherlands, 3.8 percent in Switzerland, and 1.6 percent in Japan, according to the OECD. If the United States could reduce administrative costs down to Canadian levels, it would save 68 percent of current administrative expenditures; reducing to German-level administrative costs would save 42 percent of current administrative expenditures. However, to assume that by simply adapting another country’s health care system—whether it is Canada’s single-payer Medicare, Germany’s sickness funds, or Switzerland’s heavily regulated private plans—the United States would automatically achieve the same level of administrative costs may ignore other fundamental differences between countries, including the market power of health care providers, political systems, and attitudes toward health care. 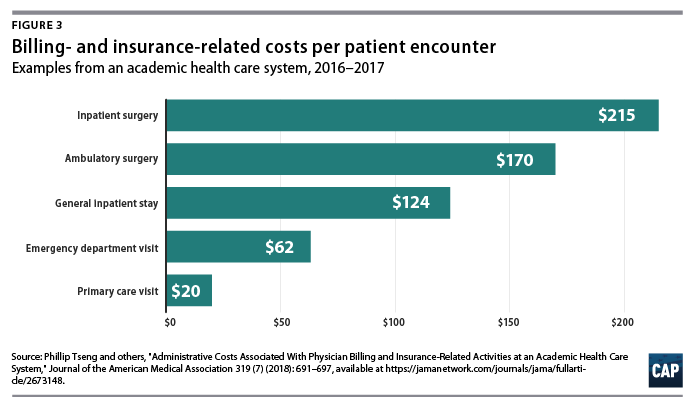 Nevertheless, the experience of other multipayer systems such as those in Germany and Switzerland suggests that the United States could substantially reduce both administrative expenditures and overall health care spending by bringing down reimbursement rates and regulating insurance—even while continuing to allow multiple payers and private health care providers. 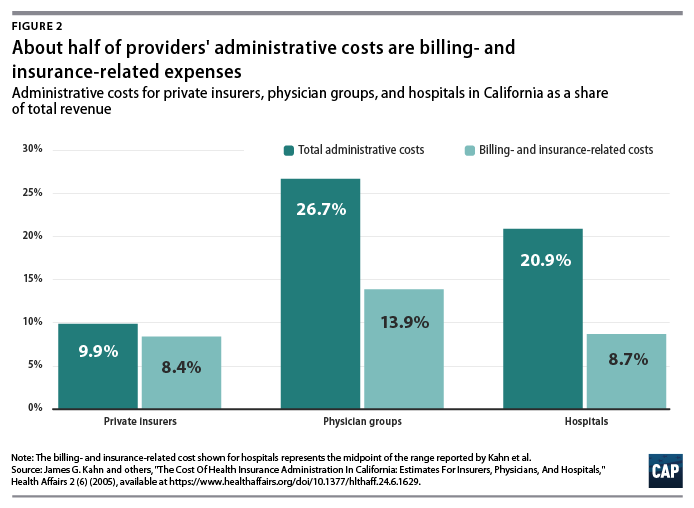 As with BIR costs, provider administrative costs in the United States are higher than those in other comparable countries. 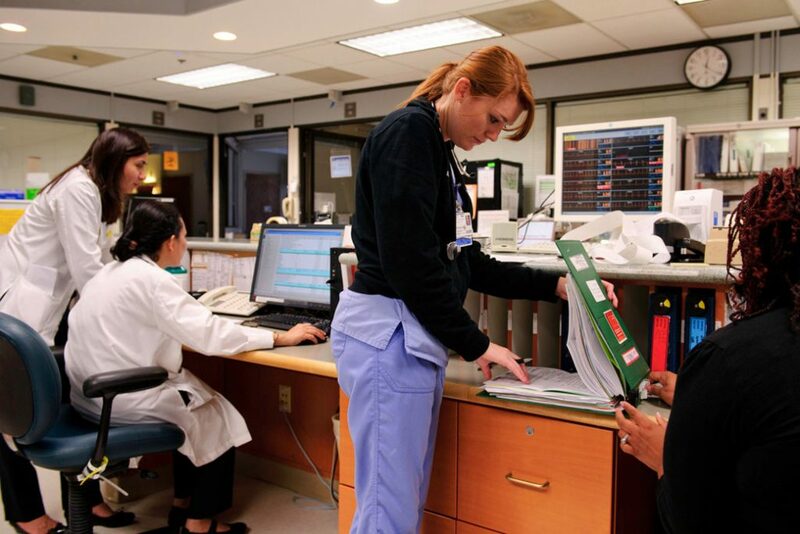 Hospital administrative costs in the United States far exceed those of other nations. In their comparison of hospital administrative costs among eight Western nations, Himmelstein and co-authors found that the United States had the highest levels, at 25.3 percent of total hospital expenditures.48 They conclude that in nations where hospital administrators have minimal responsibilities for procuring financing and where the hospital reimbursement system is least complex, administrative costs can be reduced to 12 percent of expenditures.49 These findings suggest that reforms that introduce global budgeting or limit the need to bargain with multiple payers could potentially bring down excess hospital administrative costs in the United States. Although administrative costs contribute to the high expenditures in the United States, they are not the primary reason for the health care spending gap. 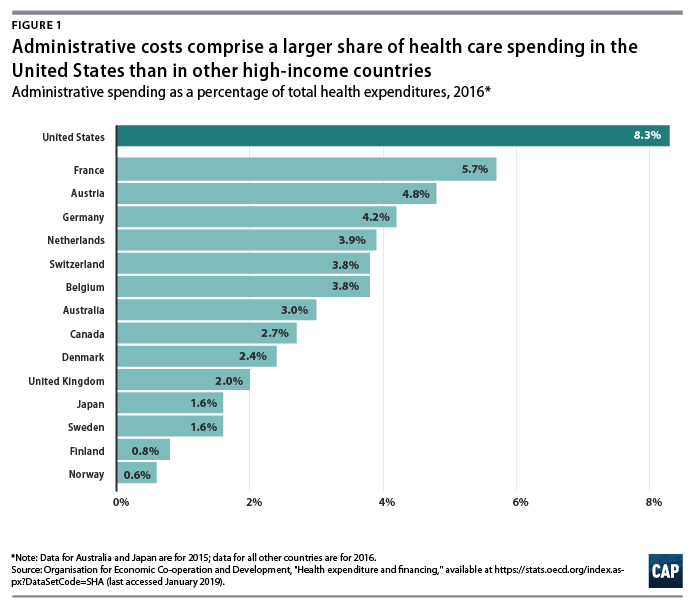 As economist Uwe Reinhardt and others candidly put it, “It’s the prices, stupid.”50 The United States pays more for care than other countries do—both for administrative services and for other components of health care. Global budgeting—the practice of paying providers revenue based on their expected costs—also holds promise for both lowering administrative spending and overall costs. As opposed to traditional fee-for-service payments, which reward providers for doing more, global budgeting incentivizes providers to deliver care more efficiently.60 Global budgeting is a feature of many countries with much lower health care administrative costs, including Scotland, Wales, and Germany.61 As Woolhandler, Campbell, and Himmelstein point out in their 2003 article, “The existence of global budgets in Canada has eliminated most billing and minimized internal cost accounting, since charges do not need to be attributed to individual patients and insurers.”62 As Germany shows, both single-payer and multipayer systems can use global budgets. In their analysis of three universal health care options for Vermont, including single payer, researchers William C. Hsiao, Steven Kappel, and Jonathan Gruber estimated substantial savings from administrative simplicity from each option. The two single-payer options they examined would result in even greater administrative savings of between 7.3 percent and 7.8 percent, depending on the rate-setting mechanism.68 The group estimated that a third scenario, which would establish a centralized claims clearinghouse while allowing multiple payers, could generate savings equal to 3.6 percent of total expenditures.69 This suggests that about half of the total administrative savings from a single-payer system could be obtained within a regulated multipayer system. While major changes to the U.S. health care system have the greatest potential to bring down costs, more incremental changes could reduce administrative waste. A recent bill proposed by Sens. Bill Cassidy (R-LA) and Tina Smith (D-MN) would direct the HHS secretary to set goals to cut “unnecessary costs and administrative burdens” throughout the health care system by 50 percent over the next 10 years. It would also provide grant money for state-based efforts to bring down administrative costs.70 Some possible avenues for achieving those kinds of reductions include changes to payment rules, improvements to facilitate electronic record-keeping and information exchange, and simplification of public insurance programs. Although estimates vary, a large body of evidence shows that the United States is spending about twice as much as needed on the administration of health care. Other nations enjoy world-class health care systems while spending a fraction of what the United States does on governance, billing, and insurance. A structural overhaul of how health care is financed and priced that includes key features of other countries’ systems—whether one payer or many—would go a long way toward eliminating excess administrative costs. Simplifying the payment system should be an essential part of future health reform and would make the U.S. system work better for taxpayers and patients alike. Emily Gee is the health economist of Health Policy at the Center for American Progress. Topher Spiro is the vice president for Health Policy and a senior fellow for Economic Policy at the Center.